Immediately before cooking the sprouts remove yellowed or damaged leaves, rinse and gently cut onto the cross on top, so you get rid of the bitterness. Brussels sprouts put a small amount of cold water, if we want this to its taste and aroma passed into broth (eg. Cooking soup). If you cook Brussels sprouts as a separate dish, we throw it on the boiling water - thanks to retain most of their juices. Fresh brussels sprouts cook for 5-7 minutes. Time start to count from the time of re-boil water. Immediately after setting with salt. It is also slightly sweetened, which make Brussels sprouts retain their green color. In the middle of the cooking water may be added to the milk to aid in preventing leaching of calcium from bones by the microelements contained in Brussels sprouts. After boiling pot discover that had faded essential malodorous, then-cooking under cover. You do not cover - then retain more green. 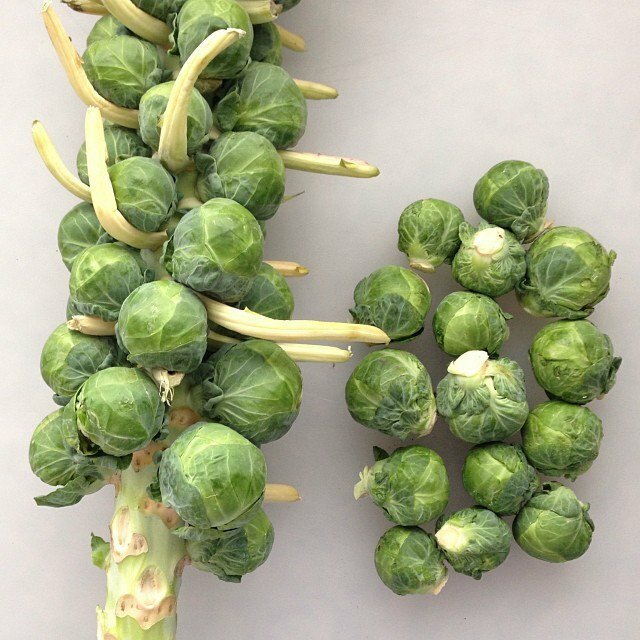 To verify that Brussels sprouts are already cooked, you can stick a fork or a knife. If it falls softly, they are ready. After cooking Brussels sprouts drain off. In order to maintain a beautiful green color you can toss cooked Brussels sprouts for 1 minute into the water with ice cubes. Sprinkle with browned on dry frying pan with bread crumbs. Serve hot dishes of meat, fish, poultry and eggs. See how to boil frozen Brussels sprouts.